A.S.K. Foods, Inc. of Palmyra, Pennsylvania is voluntarily recalling one lot of Hannaford Supermarkets’ TASTE OF INSPIRATIONS CLASSIC RED SKIN POTATO SALAD Net Wt. 16 oz. (454g) because it may contain undeclared egg. A.S.K. Foods, Inc. of Palmyra, Pennsylvania is voluntarily recalling one lot of Hannaford Supermarkets’ TASTE OF INSPIRATIONS CLASSIC RED SKIN POTATO SALAD Net Wt. 16 oz. (454g) because it may contain undeclared egg. People who have an allergy or severe sensitivity to egg run the risk of serious or life-threatening allergic reaction if they consume these products. The recalled Classic Red Skin Potato Salad was distributed and sold at Hannaford Supermarkets in ME, NY, MA, NH and VT. 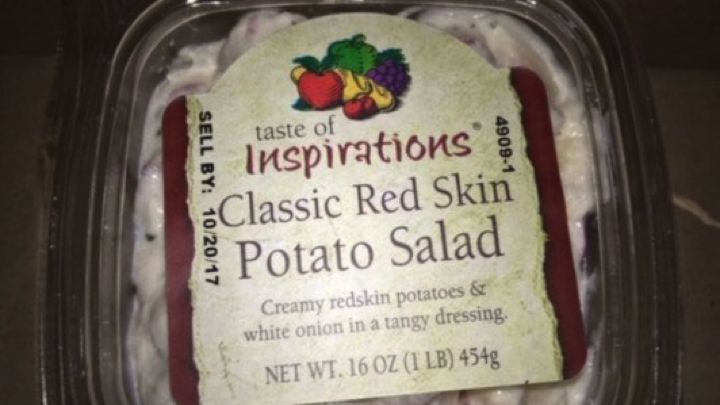 The recalled product was packaged in 16 ounce (454g) clear plastic containers having a label that states Taste of Inspirations Classic Red Skin Potato Salad on the lid. The recalled product has a code on the lid that states “SELL BY: 10-20-17 4909-1” and is mis-marked with the incorrect UPC 25439 98422 on the side/bottom label. The recall was initiated after it was discovered that certain packages of the recalled product contained an ingredient and nutrition label from another product [Taste of Inspirations Rotini Salad] that did not reveal the presence of egg. People who have an allergy or sensitivity to egg should not consume the recalled Classic Red Skin Potato Salad. If you still have this salad, please return it to the Hannaford Supermarket store that you purchased it from for a full refund.